The pedal triangle is the triangle formed by the intersections of the perpendiculars from a given point to each side of a given triangle. Let me show you a picture of what I'm talking about. 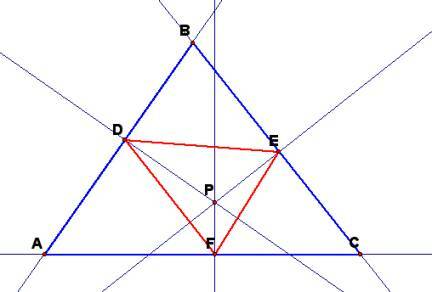 The blue triangle ABC is the given triangle point P is the given point and the red triangle DEF is the pedal triangle. Here is the GSP sketch if you'd like to look at it for yourself or make a script from it. There is a great relationship between the circumcircle and the pedal point P.